Mix all ingredients together. Put in greased casserole. 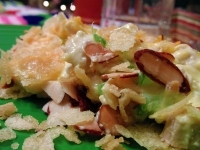 Sprinkle with crushed potato chips. Bake at 400° for about 30 minutes. Recipe categories: Chicken, Main dish, One Dish meal.